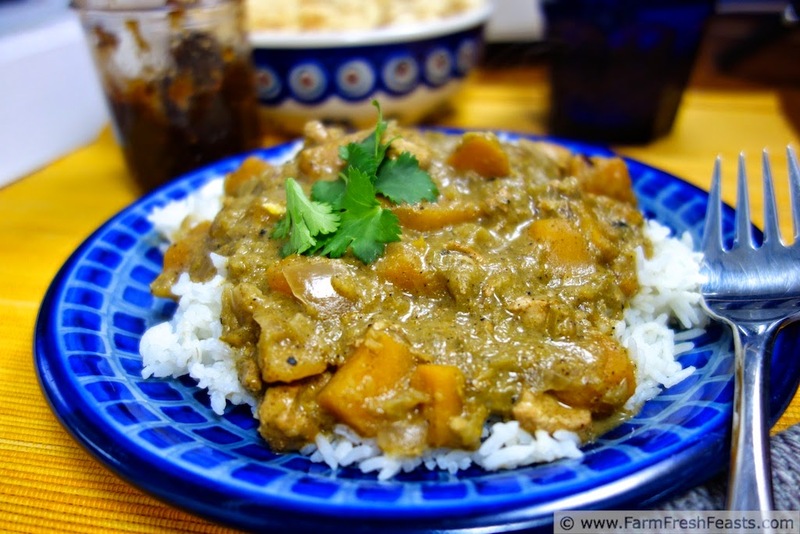 This slow cooker green tomato curry is studded with cubes of buttercup squash and chunks of marinated chicken. A flavorful and vegetable-filled warming meal. Buttercup squash are kind of homely looking, aren't they? Compared to the smooth unblemished skin of a butternut, they end up looking like the barnacle-covered whales of the winter squash family. No matter what a buttercup squash looks like on the outside, on the inside it's a thing of beauty. A buttercup squash has rich orange flesh that can be peeled and cubed or roasted whole and pureed. Use it like you would most of the winter squash family (exception: spaghetti squash). 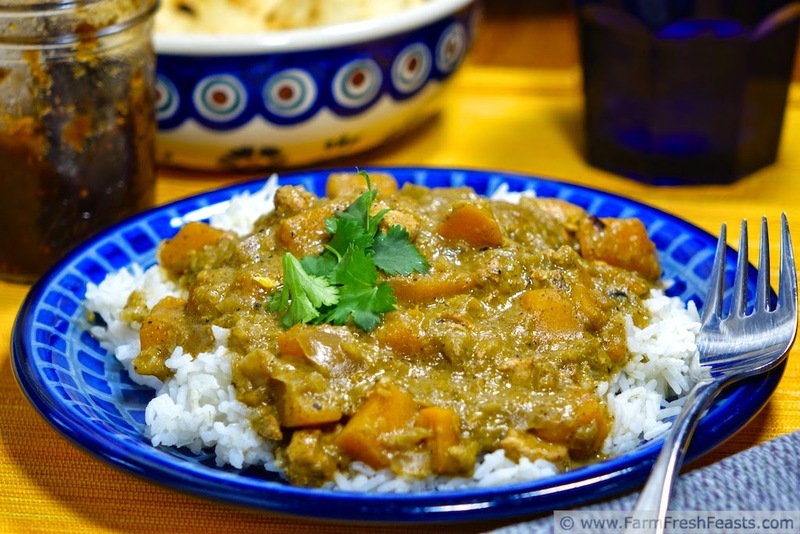 This recipe combines a buttercup squash with green tomatoes and chicken in a slow cooker curry. Let's start off with a bit of behind the scenes--I used (with my left hand) a piece of black foam core board to decrease the light coming in from the window to take the photo in the upper left corner of the collage below. My first attempt, with just the white foam core reflector (yes, held up by my right foot) is in the lower left corner. 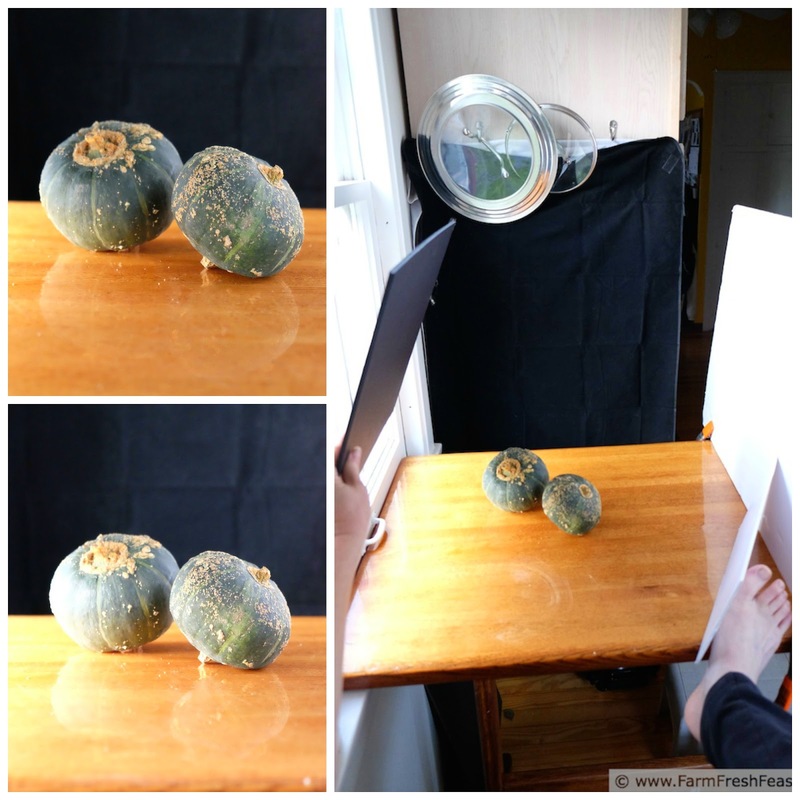 You can see how bright it is--blown out and missing detail on the buttercup squash. You can also see how athletic it is to be a food blogger. When I was digging around Google to determine the best time to post my Green Tomato Bacon Jam recipe, I learned that September is the busiest month folks search for "green tomato recipes". 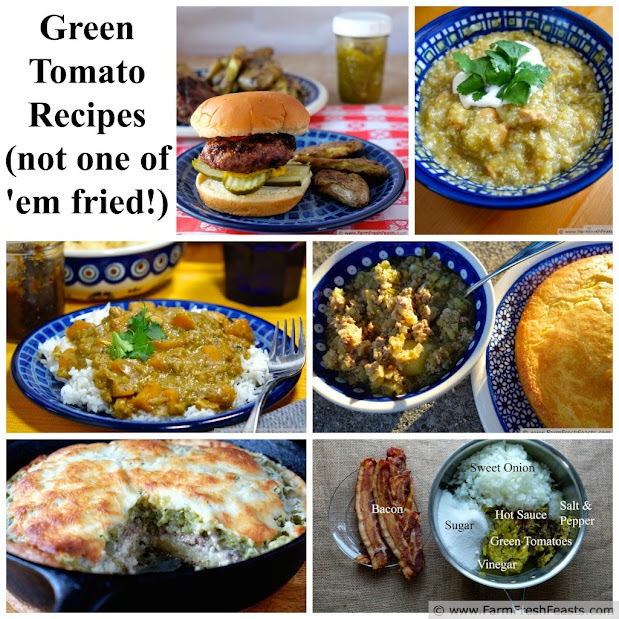 Since I'm racking and stacking the green tomato recipes (see my Clickable Collage of Green Tomato Recipes below) I thought a curry would be a great addition to my 'everything but a fried green tomato' group of recipes. Rebecca's Slow Cooker Chicken Tikka Masala recipe is my Mother Recipe for a whole host of curries that my family enjoys. It started when I first tried it on the road, visiting my in-laws. That version, my Chicken and Chana Chick Pea Tikka Masala recipe, uses less chicken and adds chick peas for protein. I've made Beef Tikka Masala with Summer Squash and again with green tomatoes. Each variation I make results in a flavorful meal that my whole family enjoys. If you're not into chicken, this vegan green tomato stew looks pretty tasty and this Shrimp, Pineapple, and Butternut Squash Curry looks divine. 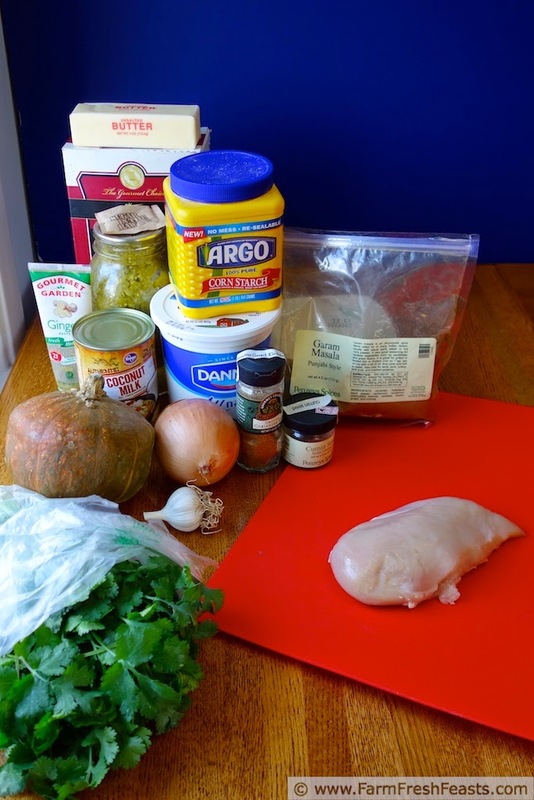 Notes: This recipe starts the night before with marinating the chicken. If you cannot find a buttercup squash, please feel free to substitute a butternut squash. Just peel, scrape out the seeds, and chop into cubes. Serve it alongside basmati rice and some warm naan (I get mini ones from Costco and heat them in the toaster). This curry is enhanced with a dollop of my Apple Fig Chutney. This slow cooker green tomato curry is studded with cubes of buttercup squash and chunks of marinated chicken. A flavorful and vegetable-filled warming recipe. Prep time includes marinating the chicken. Serve with hot cooked basmati rice, fresh cilantro, and warm naan bread. Great with my Apple Fig Chutney. Chop chicken into bite sized pieces. In a medium bowl, combine with yogurt, cumin, coriander, ¾ teaspoon salt, and marinate in the refrigerator 6 hours or overnight. In a very large skillet (mine's 12 inches) over medium heat, melt 2 Tablespoons butter. Sauté the chicken in butter until browned, then transfer the chicken to a slow cooker. Add the remaining butter to the skillet and sauté the onion and squash until the onion begins to soften--about 5 to 8 minutes for me. Add the chopped chile, garlic, ginger, remaining 2 teaspoons salt and garam masala to the skillet and sauté until fragrant. Stir the green tomatoes and sugar into the skillet. Bring to a boil and simmer 5 minutes. Pour the contents of the skillet into the slow cooker on top of the chicken. Cover the slow cooker, plug in the darn thing, turn it to LOW and cook for 4 to 5 hours. About 15-30 minutes before you're ready to serve, combine the coconut milk with cornstarch in a small bowl. Stir into the curry in the slow cooker and heat until it begins to bubble and thicken. Serve with hot cooked basmati rice (I use my slow cooker), warm naan (I get the small size at Costco and heat in the toaster), and Apple Fig Chutney or the chutney of your choice. Maybe a bit of plain yogurt if you like. It was wintertime when I first made this curry. 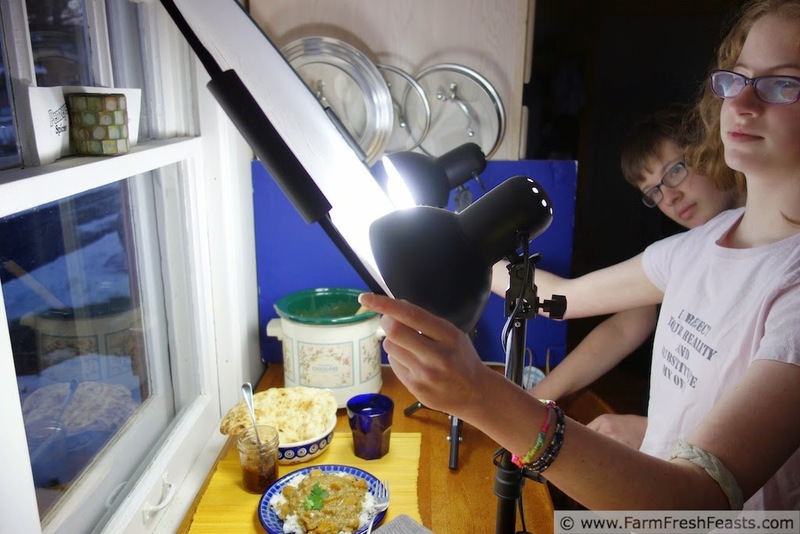 I had my lights set up with my minions keeping everything on my skinny table and holding the diffuser. First I used my trusty little point and shoot camera, the type of camera that I said was less important than the person pushing the button. For more recipes using buttercup or butternut squash, please see my Buttercup/Butternut Squash Recipes Page. For more recipes using green tomatoes, please see my Green Tomato Recipes page. These pages are part of the Visual Recipe Index by Ingredient, a resource for folks like me eating from the farm share, the farmer's market, the garden, the neighbor's garden, and great deals on ugly produce at the grocery store. Oh my, this looks great, such a nice flavor combination. It's hard to make a curry look good, so thanks! 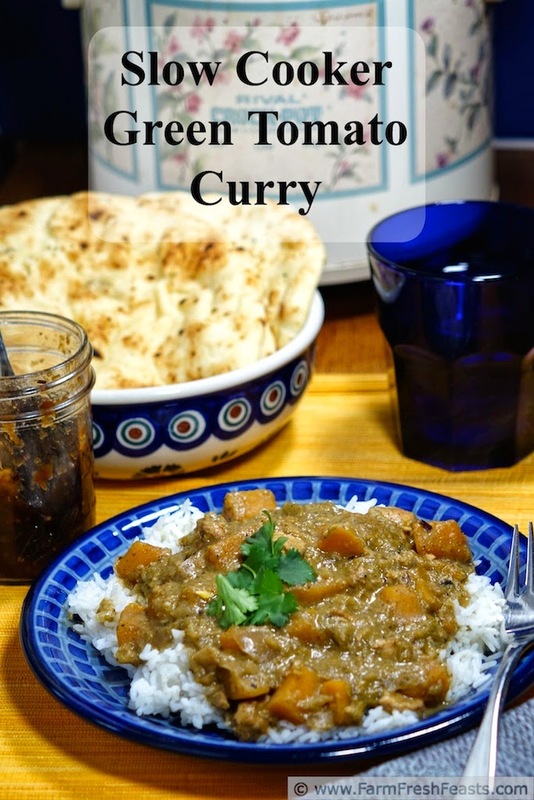 I love the idea of a green tomato curry. Perhaps even enough to give up the notion of them fried. Thanks for all the behind the scenes stuff. It certainly is helpful for me. Behind the scenes works for me too-I'm such a visual learner. Kirsten your photos are looking downright scrumptious!! I love the behind the scenes photos. I'm thinking I am going to break down and go buy a lightbox this Fall. I have pretty good light now that I have a balcony again but I'm a wee bit worried for when the rainy season starts and it's dark for 6 months. haha... I'd love to hear more about the class you took! Also, I ADORE the look of buttercup squash! I think they're ugly little fuggles. But totally cute and real. Like Pugs. Or feet. And now I'd like you to please dish me up a bowl o fthis green tomato curry business. Thank you. Pugs. Snort. In April 2013 I did the free 30 Days to Better Food Photography class at Learn Food Photography.com which gave me a brief assignment each day and at the end I'd learned a ton. Neel repeated the course in the fall, reminding me again of some of the aspects I'd overlooked the first go 'round. I have a light box, but it could double as a camping tent because it's so big it fills up the table!